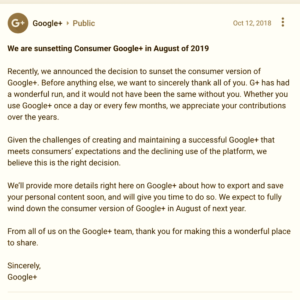 As any reader of Necropraxis is likely already aware, Google Plus will be closing shop in August 2019, and people who like to talk about tabletop roleplaying games on G+ are looking for a replacement. Mewe, a privacy-focused non-Facebook social media platform, seems to be one of the main contenders. The day of the G+ sunset announcement was the first time I had ever heard of Mewe, but I created an account and have been moderately active over the past week or so. Mewe seems reasonably functional, and even offers some improvements compared to Google Plus, but it is currently missing a feature like collections, which supports the ability for site users to categorize their own posts in a way that allows readers to opt out of seeing posts from particular categories. Other than that, Mewe fits the way I want to use social media pretty well. Certainly better than a twitter-alikes, forum-alikes, or IRC-alikes, which seem like the only other real options so far, apart from Facebook, which is a nonstarter (for me). I have been blogging and reading blogs regularly since… 2011? so a “new blog renaissance” actually seems like the status quo rather than a substitute for a social media platform. 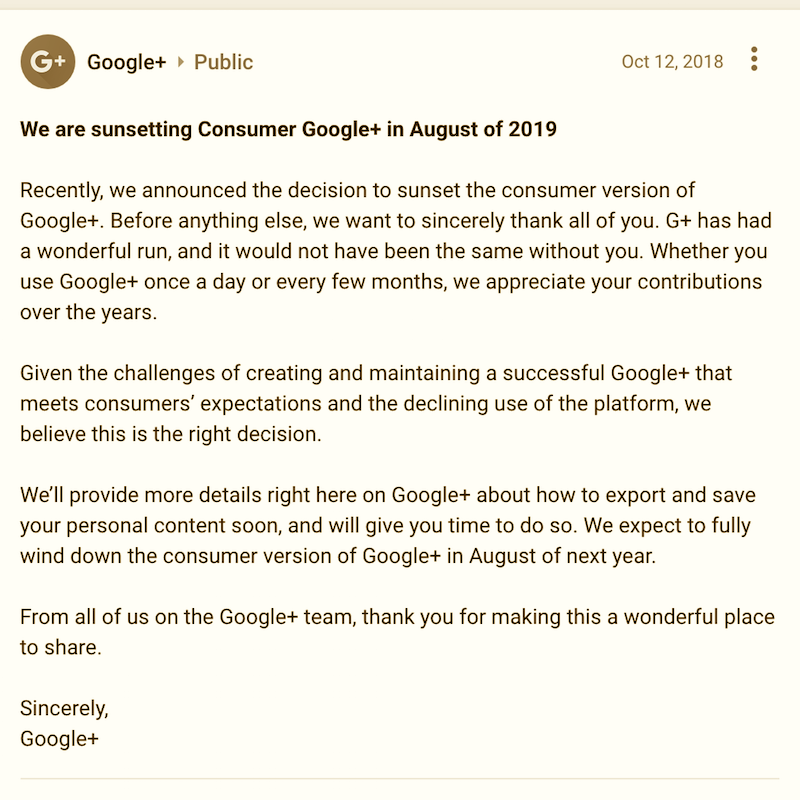 I appreciate that the Google Plus sunset announcement has spurred some people to start new blogs, but as long as I have been participating in the blog scene, there is has always been a regular churn of new voices, and people who move on, including over the last few years when conversation on Google Plus was at peak. Some people have noted the lack of capabilities to post publicly and the need to login to the site before any content is viewable. The peer to peer and default-private design of Mewe is actually what I prefer; unlike others who seemingly want everything public to increase readership, visibility, and marketing reach, I don’t really care about those goals one way or the other. Anything that I want more public or generally searchable goes on the blog. If it is useful to others, great; if not, no skin off my back. I do miss the lack of a feature such as collections though. On Google Plus, most of my activity was about tabletop RPGs, or adjacent topics such as manga, which could reasonably coexist in a single feed. Occasionally, however, I like to post about cocktails, fitness, and other unrelated topics. I don’t want to deposit all that on a single feed. And I don’t want to create a private group for it and invite others, or participate in some general group, which is basically just a forum with a more proprietary interface, and those are the two workarounds supported by Mewe’s current feature set, as far as I am aware. I want a way to curate what I post and curate what I read, at the level of individual connections. The way I use Google Plus, I have three main circles which organize my connections. Once circle serves as an inbox, grouping the people that I want to see content from. This is the feed I browse. (You can browse the feed from specific circles under “Circle Feeds” in the G+ user interface.) Browsing my inbox feed directly allows me to avoid Google’s spam-laden algorithm-sorted default home feed, which I loathe. Mewe allows users to selectively remove a user’s content from the home feed, while retaining a connection to the user, which serves this same purpose. The other two circles control access to what I post. One, which I call outbox, allows access to any content related to games or adjacent topics. The other, which I call ephemera, is for the secondary topics. 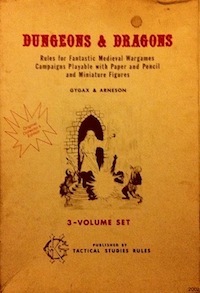 Then, I associate various collections, such as Dungeons & Dragons, movies, cocktails, and so forth, with either outbox or ephemera. That allows anyone in, for example, my outbox to opt out of my manga collection to avoid seeing Berserk panels or whatever. This entry was posted in Community on October 17, 2018 by Necropraxis.